Attended El Bonito High School in Santo Domingo, Dominican Republic…did not play organized baseball growing up, but instead played a Dominican version of cricket called "La Plaquita.".. Grew up in the same neighborhood as former teammate Welington Castillo...His grandmother was a nanny for former Major league pitchers Pedro and Ramón Martinez…credits Pedro with teaching him how to throw a change-up. Missed the entire season while recovering from his second Tommy John surgery…underwent the procedure on Aug. 22, 2017. Established career highs in virtually all categories in his first season with the D-backs, going 14-9 with a 4.67 ERA (98 ER in 188.2 IP) and 150 strikeouts in 32 starts…Is 1 of 4 pitchers with 14+ wins in their fi rst season with the D-backs, joining Randy Johnson (17 in 1999), Dan Haren (16 in 2008) and Andy Benes (14 in 1998)…Haren and De La Rosa are the only 2 on the list acquired via trade prior to said season…Tied for fifth in the NL with 8 wins after the All-Star Break…Was ninth in the NL with a .214 mark vs. righties (78-for-364)…Averaged 94.2 MPH on his fastball, seventh highest by a NL starter…His 5.77 run support average (121 RS) was third highest in NL…His ERA would have been 4.00 (76 ER in 171.0 IP) minus his 4 starts vs. Dodgers (0-3 with an 11.21 ERA)…Made his D-backs debut on April 7 vs. Giants (W, 6 ER in 5.1 IP)…Had a career-high 12.0-inning scoreless streak from May 1-12…Threw a career-high 9.0 innings in a no-decision on May 18 @ Marlins (2 ER)…was the fi fth pitcher in club history to not factor in the decision when lasting 9.0 innings, joining Edwin Jackson (June 2, 2010 @ Dodgers), Miguel Batista (May 28, 2002 @ Giants), Randy Johnson (May 8, 2001 vs. Reds) and Omar Daal (April 11, 2000 @ Padres)…Pitched in the first De La Rosa vs. (Jorge) De La Rosa matchup in baseball history on June 25 @ Rockies…Recorded 34 ground balls combined in 2 starts on July 20 vs. Marlins (16) and July 25 vs. Brewers (season-high 18). Played 19 games (18 starts) over two stints with Boston and was 4-8 with a 4.43 ERA (50 ER in 101.2 IP)…established career highs in starts, strikeouts (74) and innings pitched...Allowed one run or less in six starts, tied for second most on the team with John Lackey...Won his season debut with 7.0 scoreless innings on May 31 vs. Rays...Posted a 2.64 ERA (13 ER in 44.1 IP) in his first seven starts from May 31-July 19...Began the season with Triple-A Pawtucket and was 2-4 with a 3.45 ERA (23 ER in 60.0 IP) in 12 starts...Traded to the D-backs on Dec. 12 with RHP Allen Webster and INF Raymel Flores for LHP Wade Miley. Finished 7th among National League relievers with a 1.7 BB/9.0 IP ratio (12 BB) in 63 relief appearances for MIL. Posted a career-best 1.19 WHIP (62 hits/12 walks) in 62.1 innings. Held righties to a .229 AVG (35-for-153). Went 1-0 with a 2.05 ERA (5 ER/22.0 IP) over his final 21 appearances of the season after going 1-3 with a 4.24 ERA (19 ER/40.1 IP) over his first 42 games of the year. Made a season-high 15 appearances in May and posted a 1.13 ERA (2 ER/16.0 IP) with 15 SO for the month. Did not issue a walk in a season-best 15 consecutive appearances (11.0 IP) from 4/7-5/14/13…Ended the season with no walks in each of his final 9 games (6.1 IP) of the season. Made 1 major league appearance for LAD in return from 2011 Tommy John surgery.Began the year on the 60-day DL recovering from Tommy John surgery and was reinstated on 8/21...Madeonly ML appearance of the year on 8/22 vs. SF, allowing 2 runs in 0.2 innings of relief.Combined to go 1-0 with a 2.08 ERA (3 ER/13.0 IP) and 12 strikeouts with just 8 hits allowed over 6 minorleague outings (3 starts), including 4 appearances (3 starts) on rehab.Began a rehab assignment on 7/29 with 2 games (1 start) for High-A Rancho Cucamonga...Rehab was transferred to the Arizona League on 8/13, where he threw 3.0 scoreless innings of 1-hit ball in his only start...Returned to the Quakes to complete rehab assignment with a 8/18 start.Optioned to Chattanooga for his final 2 outings of the season, both in relief, on 8/27 and 8/31. Made 13 appearances (10 starts) in his first Major League season, going 4-5 with a 3.71 ERA before having season-ending Tommy John surgery on Aug. 9...limited opposing hitters to a .244 clip with 60 strikeouts and just 31 walks over 60.2 innings pitched...Had his contract purchased from Double-A Chattanooga on May 24 and made his Major League debut the same day against Houston, fanning two in a scoreless inning of relief...Picked up his first career victory on May 27 in a 2.0 inning relief outing against the Marlins...went 1-0 with a 1.80 ERA (1 ER/5.0 IP) and allowed just three hits (3-for-17, .176) in three relief appearances...Won his first big league start opposite Roy Oswalt and the Philadelphia Phillies on June 7, allowing one run on four hits in 5.0 innings of work in the club's 6-2 victory...went 3-5 with a 3.88 ERA (24 ER/55.2 IP) as a starter...Despite going 1-3 over his final six starts, he posted a 2.57 ERA (10 ER/35 IP) with 33 strikeouts...had arguably the best start of his young career on July 9 vs. San Diego, allowing no runs on one hit while striking out a season-high eight batters over 6.0 innings of work...tossed a season-high 7.0 innings on two occasions, June 29 at Minnesota and July 4 against the Mets...Allowed three runs or less in eight of his 10 starts...Opened the season with Double-A Chattanooga, going 2-2 with a 2.93 ERA in eight starts...limited opponents to a .199 batting average and had 52 strikeouts in 40.0 inning. Spent the season with the Rookie-level AZL Dodgers going 0-1 with a 6.06 ERA in five games (two starts)...Fanned 22 batters and did not allow a home run in 16.1 innings pitched...Posted a 3.86 ERA (5 ER/11.2 IP) and limited opposing batters to a .163 clip in his three relief outings. Made a team-high 12 starts, going 1-4 with a 1.71 ERA (9 ER/47.1 IP) for the Dominican Summer League Dodgers...ranked second on the club in ERA and strikeouts (51)...Limited opposing hitters to a .197 average and did not surrender a home run over 47.1 innings pitched...Owned a 1-2 record with a 1.23 ERA and held the opposition to a .130 clip in five road starts. Signed as a non-drafted free agent on July 2 and made his professional debut two days later with the Dominican Summer League Dodgers...finished the season with no record and a 13.50 ERA in six games (one start)...Did not allow a run and surrendered just two hits in three innings of work in the eighth and ninth innings. April 4, 2019 RHP Rubby De La Rosa assigned to Reno Aces. 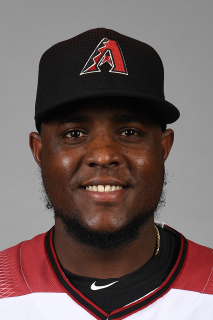 January 31, 2019 Arizona Diamondbacks invited non-roster RHP Rubby De La Rosa to spring training. September 20, 2018 Jackson Generals activated RHP Rubby De La Rosa from the 7-day injured list. April 4, 2018 Jackson Generals placed RHP Rubby De La Rosa on the 7-day disabled list. November 7, 2017 Arizona Diamondbacks signed free agent RHP Rubby De La Rosa to a minor league contract. November 7, 2017 RHP Rubby De La Rosa assigned to Jackson Generals. September 1, 2017 Arizona Diamondbacks released RHP Rubby De La Rosa. August 14, 2017 Reno Aces placed RHP Rubby De La Rosa on the 7-day disabled list. August 4, 2017 Arizona Diamondbacks optioned RHP Rubby De La Rosa to Reno Aces. July 26, 2017 Rubby De La Rosa roster status changed by Arizona Diamondbacks. July 19, 2017 AZL D-backs sent RHP Rubby De La Rosa on a rehab assignment to Reno Aces. July 15, 2017 Arizona Diamondbacks sent RHP Rubby De La Rosa on a rehab assignment to AZL D-backs. June 23, 2017 Arizona Diamondbacks selected the contract of RHP Rubby De La Rosa from Reno Aces. May 1, 2017 RHP Rubby De La Rosa assigned to Visalia Rawhide from Reno Aces. April 6, 2017 Reno Aces placed RHP Rubby De La Rosa on the 7-day disabled list. January 11, 2017 RHP Rubby De La Rosa assigned to Reno Aces. January 10, 2017 Arizona Diamondbacks signed free agent RHP Rubby De La Rosa to a minor league contract and invited him to spring training. December 2, 2016 RHP Rubby De La Rosa elected free agency. September 9, 2016 Arizona Diamondbacks activated RHP Rubby De La Rosa from the 60-day disabled list. September 1, 2016 Arizona Diamondbacks sent RHP Rubby De La Rosa on a rehab assignment to Visalia Rawhide. August 7, 2016 Arizona Diamondbacks sent RHP Rubby De La Rosa on a rehab assignment to AZL D-backs. July 25, 2016 Arizona Diamondbacks transferred RHP Rubby De La Rosa from the 15-day disabled list to the 60-day disabled list. Right elbow sprain. May 27, 2016 Arizona Diamondbacks placed RHP Rubby De La Rosa on the 15-day disabled list retroactive to May 26, 2015. Right elbow inflammation. December 12, 2014 Arizona Diamondbacks traded LHP Wade Miley to Boston Red Sox for RHP Rubby De La Rosa, RHP Allen Webster and SS Raymel Flores. July 9, 2014 Boston Red Sox recalled RHP Rubby De La Rosa from Pawtucket Red Sox. June 28, 2014 Boston Red Sox optioned RHP Rubby De La Rosa to Pawtucket Red Sox. May 31, 2014 Boston Red Sox recalled Rubby De La Rosa from Pawtucket Red Sox. March 20, 2014 Boston Red Sox optioned RHP Rubby De La Rosa to Pawtucket Red Sox. December 10, 2013 RHP Rubby De La Rosa assigned to Tigres del Licey. November 1, 2013 Rubby De La Rosa roster status changed by Boston Red Sox. October 4, 2013 Boston Red Sox reassigned RHP Rubby De La Rosa to the minor leagues. September 1, 2013 Boston Red Sox recalled RHP Rubby De La Rosa from Pawtucket Red Sox. August 19, 2013 Boston Red Sox optioned Rubby De La Rosa to Pawtucket Red Sox. August 3, 2013 Boston Red Sox recalled Rubby De La Rosa from Pawtucket Red Sox. June 16, 2013 Boston Red Sox optioned Rubby De La Rosa to Pawtucket Red Sox. June 16, 2013 Rubby De La Rosa roster status changed by Boston Red Sox. June 14, 2013 Boston Red Sox recalled Rubby De La Rosa from Pawtucket Red Sox. March 15, 2013 Boston Red Sox optioned Rubby De La Rosa to Pawtucket Red Sox. October 4, 2012 RHP Rubby De La Rosa roster status changed by Los Angeles Dodgers. September 5, 2012 Rubby De La Rosa assigned to Great Lakes Loons from Chattanooga Lookouts. August 27, 2012 Rubby De La Rosa assigned to Chattanooga Lookouts. August 24, 2012 Los Angeles Dodgers optioned Rubby De La Rosa to Albuquerque Isotopes. August 21, 2012 Rubby De La Rosa roster status changed by Los Angeles Dodgers. August 18, 2012 sent RHP Rubby De La Rosa on a rehab assignment to Rancho Cucamonga Quakes. August 13, 2012 Rancho Cucamonga Quakes sent RHP Rubby De La Rosa on a rehab assignment to AZL Dodgers. July 29, 2012 Rubby De La Rosa assigned to Rancho Cucamonga Quakes. February 23, 2012 Los Angeles Dodgers placed RHP Rubby De La Rosa on the 60-day disabled list. Recovering from August 2011 Tommy John surgery. September 30, 2011 Los Angeles Dodgers activated RHP Rubby De La Rosa from the 15-day disabled list. August 1, 2011 Los Angeles Dodgers placed RHP Rubby De La Rosa on the 15-day disabled list. Right elbow inflammation. May 24, 2011 Los Angeles Dodgers selected the contract of RHP Rubby De La Rosa from Chattanooga Lookouts. April 13, 2011 Rubby De La Rosa roster status changed by Chattanooga Lookouts. April 7, 2011 Chattanooga Lookouts placed RHP Rubby De La Rosa on the bereavement list. January 26, 2011 Los Angeles Dodgers invited non-roster RHP Rubby De La Rosa to spring training. July 23, 2010 RHP Rubby De La Rosa assigned to Chattanooga Lookouts from Great Lakes Loons. April 27, 2010 Rubby De La Rosa assigned to Great Lakes Loons from AZL Dodgers. July 2, 2007 Los Angeles Dodgers signed free agent RHP Rubby De La Rosa to a minor league contract.